The Eleusinian Mysteries were the most famous of the secret religious rites of ancient Greece. They consisted of the Lesser Mysteries and the Greater Mysteries. 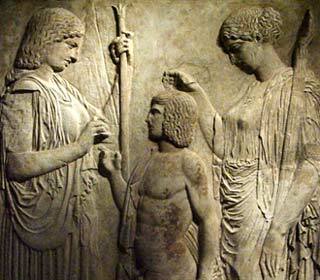 These were ceremonies for the cult of Demeter and Persephone based at Eleusis in ancient Greece. Of all the mysteries celebrated in ancient times these were held to be the ones of greatest importance. The Lesser Mysteries were held annually and it is known that these contained rites of cleansing. The Greater Mysteries were held every fourth year. They included a week of special rites, culminating in the Great Mystery rites that took place inside the Temple of Demeter. These myths and mysteries later spread to Rome. The rites and cultic worships and beliefs were kept secret, and initiation rites united the worshipper with god including promises of divine power and rewards in life after death. Eleusis (modern-day Elefsina) was a small town located about 30 km NW of Athens. It was an agricultural town, producing wheat and barley. The city of Eleusis was named after Eleusis, also called Eleusinus. Some have said that Eleusinus was the son of Ogygus, the Boeotian king who lost his land to the Phoenician immigrant or invader Cadmus, the founder of Thebes. Others told that Eleusinus was the son of Hermes and Daira, one of the Oceanids. The Mysteries were based on a legend revolving around Demeter. Her daughter, Persephone, was kidnapped by Hades, the god of death and the underworld. Demeter was the goddess of life, agriculture and fertility. She neglected her duties while searching for her daughter; causing a dry season (summer in Greece) in which people starved - today, we associate this with the first winter. During this time Demeter taught the secrets of agriculture to Triptolemus. Finally Demeter was reunited with her daughter and the earth came back to life - the first spring. Persephone was unfortunately unable to stay permanently in the land of the living, because she had eaten six seeds of a pomegranate that Hades had given her. Those that eat the food of the dead may not return. A compromise was worked out and Persephone stayed with Hades for one third of the year (winter, as the Greeks only recognized three seasons, skipping autumn) and with her mother the remaining eight months. The Eleusinian Mysteries celebrated Persephone's return, for it was also the return of plants and of life to the earth. She had eaten the six pomegranate seeds (symbols of lives) while in the underworld (underground, like seeds in the winter) and her rebirth is therefore symbolic of the rebirth of all plant life during the spring and, by extension, all life on Earth. In the Homeric Hymn to Demeter, Celeus was one of the original priests of Demeter, one of the first people to learn the secret rites and mysteries of her cult. Diocles, Eumolpos, Triptolemus and Polyxeinus were the others of the first priests. Celeus was a king whose son, Triptolemus, learned the art of agriculture from Demeter and taught it to the rest of Greece. Following are descriptions of the days in the Sacred Week that led up to the night of the Greater Mysteries. There were two Eleusinian Mysteries: the Greater and the Lesser. The Lesser Mysteries were held in Anthesterion (March) (the exact time was not always fixed and changed occasionally, unlike the Greater Mysteries). The priests purified the candidates for initiation myesis. They first sacrificed a pig to Demeter and then purified themselves. The Greater Mysteries took place in Boedromion (the first month of the Attic calendar) and lasted nine days. The first act (14th Boedromion) of the Greater Mysteries was the bringing of the sacred objects from Eleusis to the Eleusinion, a temple at the base of the Acropolis. On 15th Boedromion, the hierophantes (priests) declared prorrhesis, the start of the rites.The ceremonies began in Athens on 16th Boedromion with the celebrants washing themselves in the sea at Phaleron and sacrificing a young pig at the Eleusinion on 17th Boedromion. The procession to Eleusis began at Kerameikos (the Athenian cemetery) on the 19th Boedromion and the people walked to Eleusis, along the Sacred Way, swinging branches called bakchoi along the way. At a certain spot along the way, they shouted obscenities in commemoration of Iambe (or Baubo), an old woman who, by cracking dirty jokes, had made Demeter smile as she mourned the loss of her daughter. Then on 20th and 21st Boedromion, the initiates entered a great hall called Telesterion where they were shown the sacred relics of Demeter. This was the most secretive part of the Mysteries and those who had been initiated were forbidden to ever speak of the events that took place in the Telesterion. The penalty was death. As to the climax of the Mysteries, there are two modern theories. Some hold that the priests were the ones to reveal the visions of the holy night, consisting of a fire that represented the possibility of life after death, and various sacred objects. Others hold this explanation to be insufficient to account for the power and longevity of the Mysteries, and that the experiences must have been internal and mediated by a powerful psychoactive ingredient contained in the kykeon. Following this section of the Mysteries was the Pannychis, an all-night feast accompanied by dancing and merriment. The dances took place in the Rharian Field, rumored to be the first spot where corn grew. A bull sacrifice also took place late that night or early the next morning. That day (22nd Boedromion), the initiates honored the dead by pouring libations from special vessels.On 23rd Boedromion, the Mysteries ended and everyone returned home.In the center of the Telesterion was the Anaktoron ("palace"), a small stone building which only the hierophantes could enter. 4. Those who had attained epopteia, who had learned the secrets of the greatest mysteries of Demeter. The above is only a capsule summary - much of the Eleusinian Mysteries was never written down. For example, "kiste" and "kalathos" were a sacred chest and basket with a lid, respectively, the contents of which only initiates knew about. The contents are still unknown, and probably will be forever. The Mysteries are believed to have been begun about 1500 BCE, during the Mycenean Age. It was held annually for about two thousand years.Under Pisistratus of Athens, the Eleusinian Mysteries became pan-Hellenic and pilgrims flocked from Greece and beyond to participate. Starting about 300 BCE, the state took over control of the Mysteries, specifically controlled by two families: Eumolpidae and Kerykes. This led to a vast increase in the number of initiates. The only requirements for membership were a lack of "blood guilt", meaning having never committed murder, and not being a barbarian (able to speak Greek). Men, women and even slaves were allowed to be initiated. The Roman emperor Theodosius I closed the sanctuaries by decree in CE 392 in an effort to destroy pagan resistance to the imposition of Christianity as a state religion. The last remnants of the Mysteries were wiped out in CE 396, when Alaric, King of the Goths, invaded accompanied by Christians "in their dark garments", bringing Arian Christianity and desecrating the old sacred sites. The closing of the Eleusinian Mysteries in the 4th century is reported by Eunapios, a historian and biographer of the Greek philosophers. Eunapios had been initiated by the last legitimate Hierophant, who had been commissioned by the emperor Julian to restore the Mysteries, which had fallen into decay. The very last Hierophant was a usurper, "the man from Thespiai who held the rank of Father in the mysteries of Mithras" Eunapios calls him. There are, quite naturally, a great many paintings and pieces of pottery that depict various aspects of the Mysteries. The Eleusinian Relief, from late 5th century BCE, stored in the Archaeological National Museum in Athens is a representative example. Triptolemus is depicted receiving seeds from Demeter and teaching mankind how to work the fields to grow crops with Persephone holding her hand over his head to protect him. Vases and other works of relief sculpture, from the 4th, 5th and 6th centuries BCE depict Triptolemus, holding an ear of corn, sitting on a winged throne or chariot, surrounded by Persephone and Demeter with pine torches. The Ninnion Tablet, also from the Archaeological National Museum in Athens, depicts Demeter, followed by Persephone and Iacchus and then the procession of initiates. 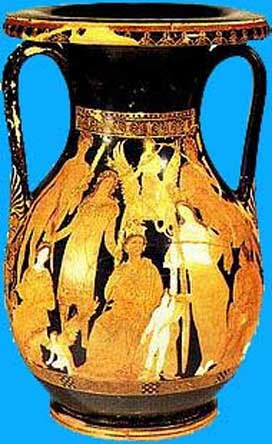 Then, Demeter is sitting (inside the Telesterion) on the kiste with Persephone introducing the initiates and holding a torch. The initiates each held a bakchoi. The second row of initiates were led by Iakchos, a male priest who held torches for the ceremonies. 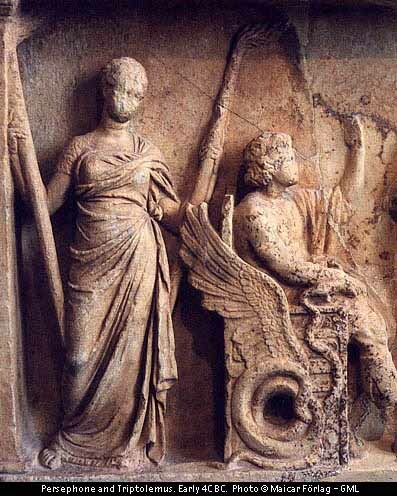 He is standing near the omphalos while an unknown female (probably a priestess of Demeter) sat nearby on the kiste, holding a scepter and a vessel filled with kykeon. Pannychis is also represented. Some scholars believe that the power of the Eleusinian Mysteries came from the kykeon's functioning as a psychedelic agent; this was argued most extensively in The Road to Eleusis, by R. Gordon Wasson, Albert Hoffman, and Carl A. P. Ruck. Barley may be parasitized by the fungus ergot, which contains LSA, a precursor to LSD. It is thus possible that the initiates, sensitized by their fast and prepared by preceding ceremonies, were propelled by the effects of a powerful psychoactive potion into revelatory mind states with profound spiritual and intellectual ramifications.This theory remains controversial, as modern preparations of kykeon using ergot-parasitized barley have yielded inconclusive results. It has been argued by Terence McKenna that the mysteries were focused around a variety of Psilocybe mushrooms, although there seems to little evidence for this. Various other entheogenic plants, such as Salvia and the Amanita mushroom, have also been suggested, but all of these theories lack any hard evidence.